What’s one question our drivers hear the most? “What’s a day on the truck like?” For this Driver’s Seat post, Kelsey is here to answer that question! 8:30 AM – I arrive at the lot in South Boston. I do a quick check of the truck (make sure the lights are working and the tires are good to go) and make a quick phone call to Whole Foods Newtonville to let them know I am on the way. 8:40 AM – I hit the road. Set the radio to NPR to get the morning news. 9:00 AM – I arrive at Whole Foods Newtonville. At this store, I enter through the back receiving area and check in with the receiver. Because we called ahead most of the food has already been brought down to the dock and is ready to be loaded. I do a check of the dates and quality of the product to ensure we only take food that is still good to be used. I record the types and weights of all the food collected using our smartphone-based inventory app and pack it into the back of the truck. 9:30 AM – I arrive at Whole Foods Newton on Walnut St. The procedure here is a little different from the previous Whole Foods. I pull up to the loading dock and enter through receiving again. Here they have a designated shelf in the refridgerator that the food for collection is stored on. 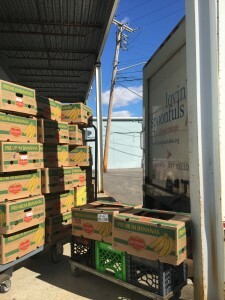 I find a cart to load the boxes on and pull the food out to the truck. I inspect everything, record all the types and weights in our inventory app and hit the road. 10:15 AM – I arrive at Wegman’s Chestnut Hill. I pull up to the loading dock. I check in with the receiver to call the meat and dairy departments who will bring down any donations they have for the day. In the meantime I head back to the dock to load up the produce which has already been collected and brought out. I record all of the product in our inventory system and load the truck. Here, I also have to record the weights of the food on a paper sheet back in receiving for their tracking purposes. After filling that out I am back on the road. 11:00 AM – I arrive at Stop & Shop in Dedham. I enter through the receiving area and walk through the store to the produce department. Here they prepare the donations each morning and keep it in a cart in the cooler until we arrive to get it. I wheel it back to recieving where the receiver has prepared all the dairy product that is ready to go out. I record all the product in our inventory app and load the truck. 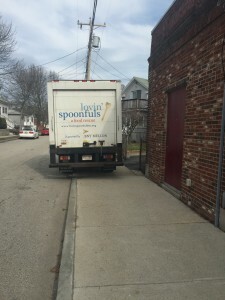 11:35 AM – I arrive at Hannaford Supermarket in Norwood. I again enter through receiving and walk through the store to the produce department. Similar to Stop & Shop, the food is waiting for me on a cart. I grab the cart from the cooler and head back to receiving. I stop by the freezer and collect any meat. 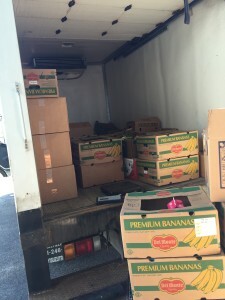 While I collect produce and meat, the receiver gathers the day’s dairy donations. I bring all these donations out to the truck. The back is getting pretty full at this point, so I have to do some rearranging of the boxes to make sure everything fits and I won’t tip over any boxes when going over bumps. (Opening up the back of the truck and finding a box turned over is the worst! Careful stacking and packing is key.) I record all the product and finish loading the truck. This is my last collection of the morning. Now I head out to start distributing the food! The truck is getting full! 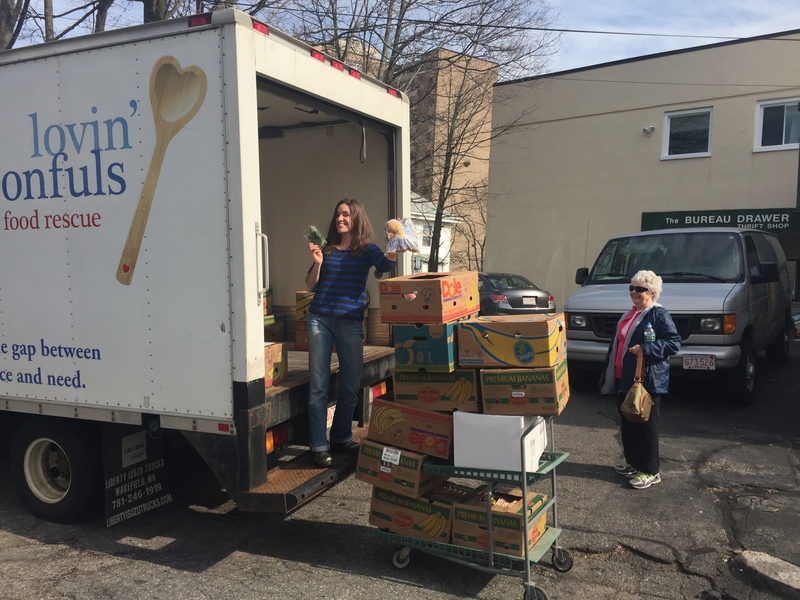 12:05 PM – I arrive at Abundant Table in Norwood, a community meal program serving the communities of Norwood, Dedham, Canton, Westwood, and beyond. This is a unique distribution; I pull up to the side of the building and use my key to get into the kitchen. They serve a meal twice a week and we deliver mostly leafy greens and salad toppings for them to use. I put the food in the fridge, record the distribution in our inventory app by type of food and weight and head back out. 12:30 PM – I arrive at Father Bill’s in Quincy. I pull up to the side of the building and find the cook in the kitchen. She comes out and picks out what she will be able to use. They usually take about 300 pounds of food. Father Bill’s is a homeless shelter which serves multiple meals per day. 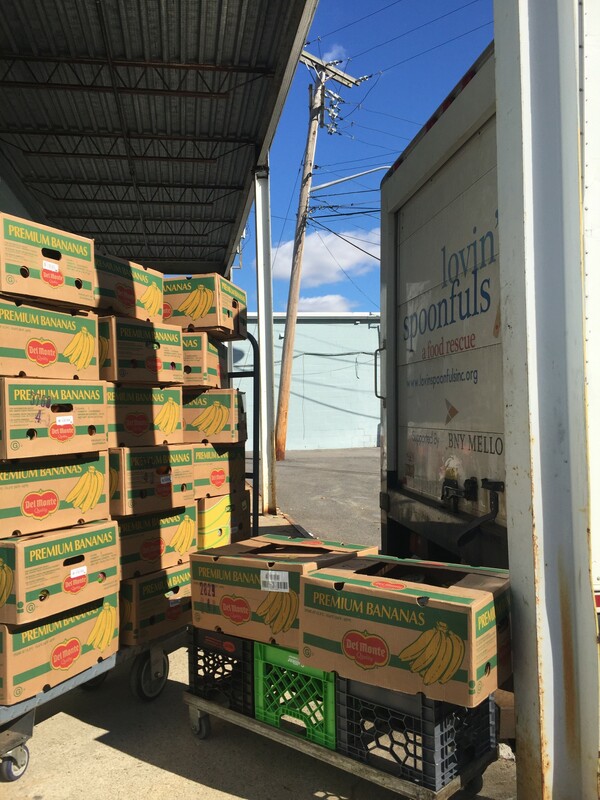 They love the fresh food we deliver – especially the cut fruit that people can grab and take with them. I log the types of food they take and the weights again. 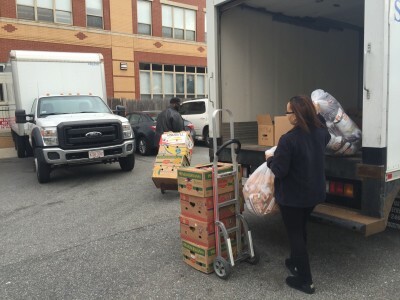 12:45 PM – I arrive at Interfaith Social Services, also in Quincy. This is a large food pantry that clients can visit once a month. Interfaith takes a pretty big delivery, they can distribute a lot of food and can accept a wide variety of food types. I almost empty my truck here. I record the types and weights here and leave with about 150 pounds of food left in the truck. 1:00 PM – I arrive at Sanger Center for Compassion in Quincy. Sanger Center delivers bags of food to people in their community. We supply most of the bread. I deliver all of the remaining bread on my truck here, which is nice because sometimes it can be difficult to distribute all of the bread we receive. They also take a few boxes of fresh produce. I record what was distributed here and head back towards Boston. But first I make a quick phone call to Whole Foods Jamaica Plain to let them know I am on my way. 1:45 PM – I arrive at Whole Foods Jamaica Plain. 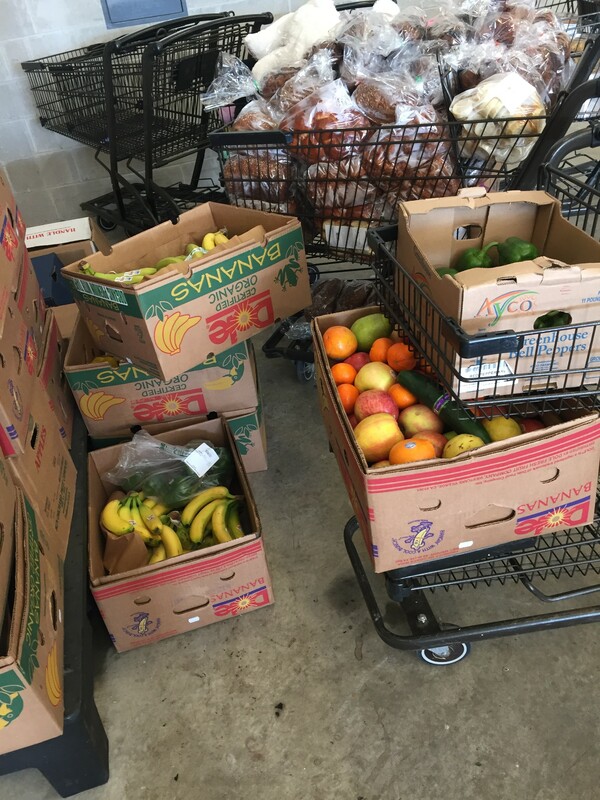 I let the produce department know I am there and they start to bring the food down to receiving, while I head back to the prepared foods department to collect any donations they have. By the time I get back to receiving the other departments have brought down their donations and I am ready to start loading up the truck. I finish loading up and head out to make my last few stops for the day. 2:10 PM – I arrive at Roxbury Youthworks. 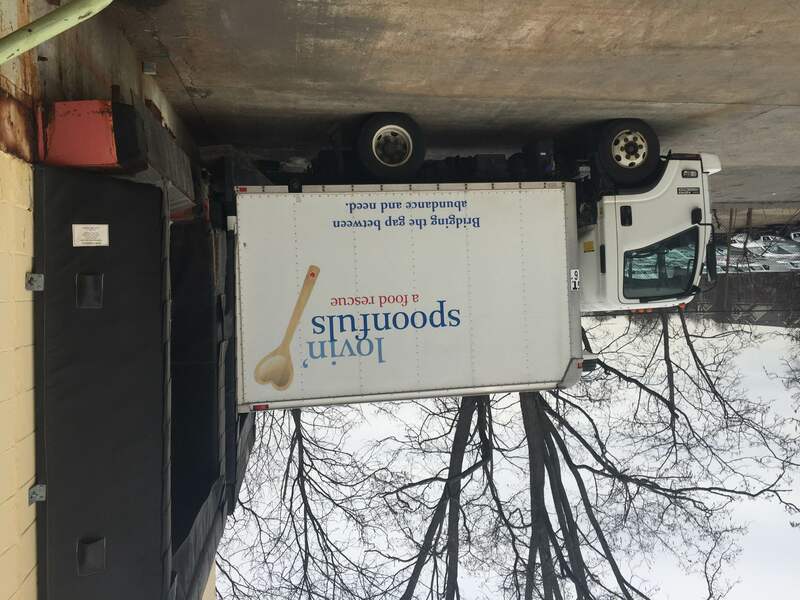 Here they serve clients by delivery. I pull up to the front door and find the youth advocate who comes out and picks out what they need to finish up their delivery bags to go out to families they serve for the day. I finish by recording the food that they picked out via our inventory system. 2:30 PM – I arrive at Catholic Charities in Dorchester. This is a very large food pantry. They move a lot of product each day. They can accept any type of product and always find a use for as much food as we drop off. 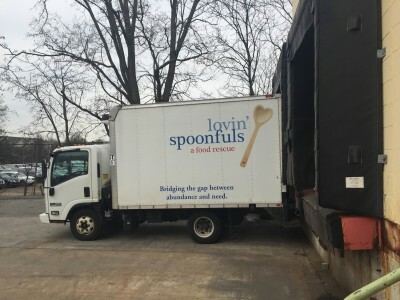 I distribute any remaining food on my truck here, finish recording all weights and head back to the lot. 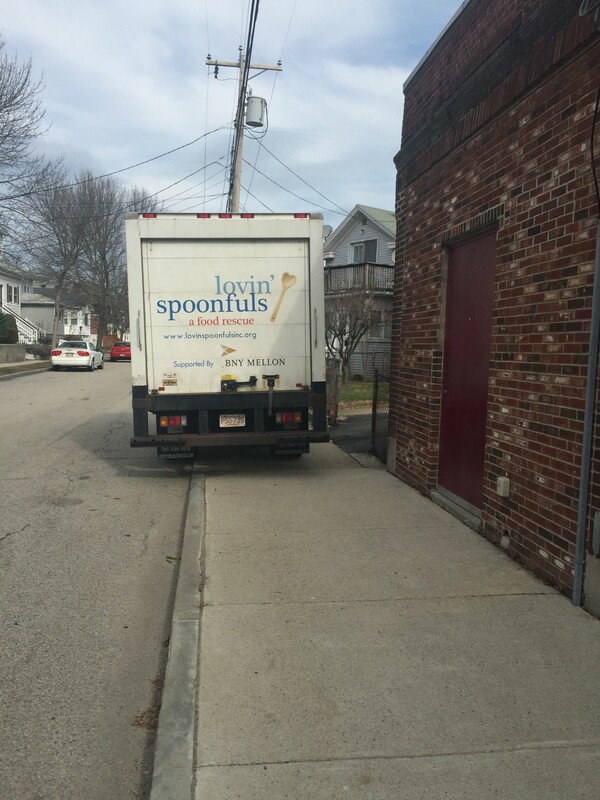 3:00 PM – I arrive back at our lot in South Boston. I sweep out the back of the truck so it’s ready for tomorrow, and lock up.